If substituting yarn or using up left overs, 50g of a DK weight for the CC colours will sufice. 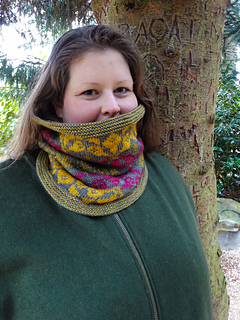 Working in the round in the Chloris Cowl colourwork pattern & after blocking. 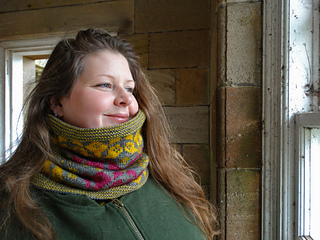 The Chloris Cowl is a close fitting cowl with plenty of length to pull up over your ears while still keeping your neck warm. 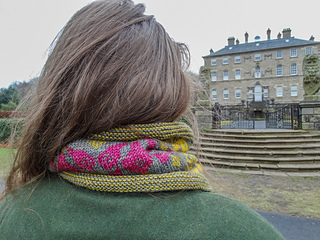 Knit in the round using stranded colourwork to create bright and bold floral motifs, Chloris is designed to bring colour into your world and keep you warm while waiting for Spring to bring warmer and longer days. 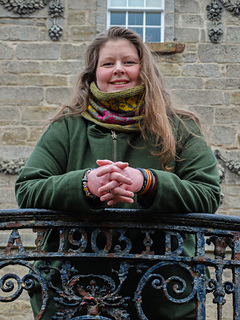 The sample is knit using Queen of Purls Hand Dyed Citadel DK which is a 100% British Blue Faced Leicester which gives the cowl a lovely drape with that beautiful silk-like lustre which BFL is known for. It’s started and finished with striped garter stitch rounds which gives it a modern and fresh feel. The pattern calls for the colourway Swamp Thang to be used as the contrast colour for the garter stitch, but you could use any of the contrast colours that you like. 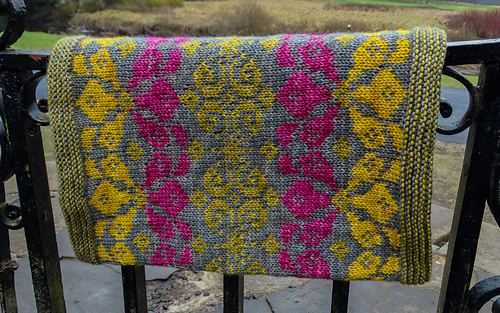 I recommend this as an intermediate colourwork project as there are long runs of stitches which means long floats, the biggest being 17 stitches long, so I’d advise being comfortable with floating your yarns. You can also catch the yarn at the back of a stitch if you prefer doing this. I personally do not as it always shows a flash of the floated colour through the front of the fabric and messes with my tension. I find the long float manageable in terms of length and wearability and there are only 4 rounds in the pattern that have this float length. There are also 8 rounds which require the use of 3 colours at once. If you are comfortable with stranded colourwork, this should be relatively easy if you’ve not done it before. 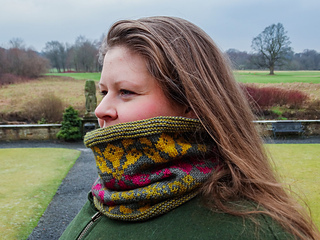 To finish the cowl, a version of the Icelandic Bind Off is used which makes an edge that is practically identical to the Long Tail Cast On that the pattern calls for. 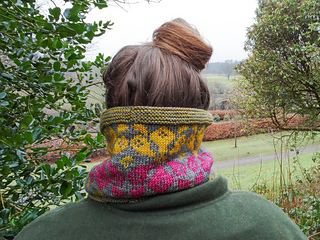 This pattern is charted with no written instructions for the stranded colourwork section!